Bringing classic stories to artful bento boxes for children, Shinizi Katoh’s new arrivals at Monkeytail and Wellington will make the most beautifully functional Christmas presents. Look at the double-decker Snow White and Alice in Wonderland boxes – they’ll carry a full meal for a growing body and be a wonderful story piece for summer picnics. There’s sure to be some new Snow White fans out there with the re-release of this classic movie, so this one is sure to sell out fast. 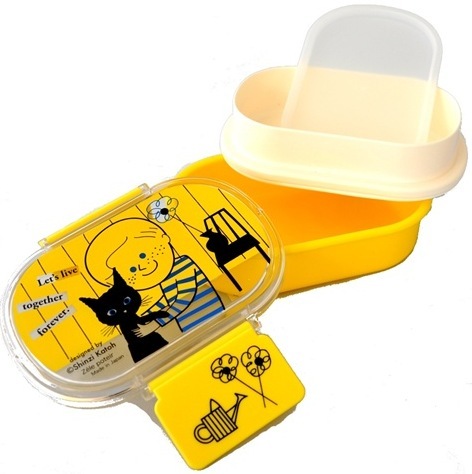 A super special mention has to go out to that gorgeous yellow bento featuring the boy with the cat. We are cat lovers in our household and that boy looks exactly like my eldest son cuddling up to his favourite Burmese cat! There are new sticky tape designs and clocks as well, so be sure to check out the range. We first told you about these gorgeous products in May 2009 and it’s great they’re so popular. The double-decker Bentos are $34.95, tape is $9.95 a roll, and clocks $79.95 each from Monkeytail and Wellington.